The Election Pundits…Who Got Closest? With each election cycle come more websites and more political predictions. With a Democratic surge apparent, and more competitive contests this year, the race for prognostications was even more intense than usual. 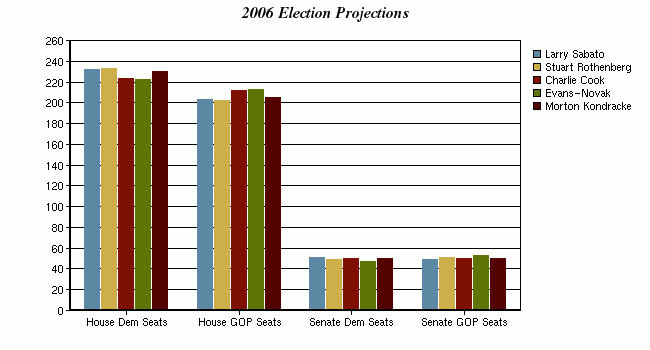 Who fared best in the 2006 midterm elections? In order to test the prognostication skills of some of the leading political pundits, the PEJ looked at 10 pre-election predictions, most from notable campaign watchers. Seven of them came from a roster compiled by blogger Ed Fitzgerald and three were included in a set of predictions published in the Nov. 5 Washington Post. At the low end of estimates for Democratic pickups in the House were “Cook Political Report” author Charlie Cook, Bob Novak’s “Evans-Novak” newsletter and a panel of GOP insiders selected by the National Journal. Fitzgerald also averaged dozens of those predictions to come up with an overall pre-election stab at the voters’ intentions. Those final average tallies (50-50 in the Senate and 229– 206 in the House) proved to be more accurate than the picks made by groups of both Republican and Democratic insiders assembled by the National Journal. And they certainly reflected the overarching consensus that Nov. 7 was going to be a big day for the Democrats. Which Polls Had it Right?